Ford Madox Brown: The Social Realism of "Work"
Ford Madox Brown's painting, Work, took over twelve years to produce, and despite the fact that he was never considered a true member of the Pre-Raphaelite Brotherhood, it made an important contribution to the movement. Brown created a social realist painting utilizing a composition crowded with figures that represented the different classes of workers in Victorian society in different acts of labor. The painting centers on the intense physical labor going on in the street, with several men working at the hole in the ground, lugging buckets of water and one man briefly pausing to take a drink of water. Their resolute expressions and movements show their hard work and determination. All around these men is evidence of more work, ranging from the barefoot peddler girl selling flowers to the young girl taking care of children and trying to keep them out of trouble in the foreground. Further to the right, in the street, Ford includes orange sellers and a variety of street life. All of these worker typify the kind of labor that the lower classes performed, and the detail and compassion with which Ford treats these figures exemplifies his admiration as he heroicizes their work. These workers make a contraste to the two men standing off to the right, leaning against the railing, who are a step above the laborers as educated intellectuals. They are dressed in jackets and appear to be observing the action, perhaps taking it in on their lunch break. Behind them, against the railing, appear a group of people resting under the shade, some of whom appear to be homeless and sleeping. The women at the left, in finer dress and parasols, walking with their skirts held up to avoid the dust, also represents members of this middle class. One of the women is distributing pamphlets, perhaps regarding the Temperance or Abolitionist movement, which was seen as an acceptable pastime for moral Victorian young women. The two figures on horseback who have just come upon this road block, towards the back of the painting, obviously represent the leisure class. All of these characters are not portrayed in stages of work, but instead as observers to the work going on around them. It does not affect them directly, other than it being a temporary inconvenience, since they are just passing through this scene. Ford focuses the light in the painting on the laboring figures, with the brightness of the sun on the men in the center and in the street to the right, whereas the middle and upper class members are painted in shadowy light. The clear contrast of labor and idleness within the painting continues on the gold frame, which contains appropriate Biblical quotations about to the virtue and importance of hard work. Brown's painting is often viewed as one of the most didactic and moralistic paintings done during this time and it could easily compared to the prints and paintings of William Hogarth. It is clear that in Work the artist is praising the hard working laborers that make up the moral backbone of society. 1. Brown's social realist painting makes an important contribution to Pre-Raphaelite movement because it very honestly depicts the reality of the Victorian working class. It has a very Hogarthian tone, and the message in his work has been compared to Hunt's in The Awakening Conscience. However Work obviously takes this realism further. Can it be said that this painting more honestly and directly expressed the artist's message, with many more publicly readable details than most social-realist Pre-Raphaelite works? Does this make his painting a more successful one in the eyes of the PRB? Or would they think it was too allegorically obvious? 2. The purposely overcrowded, busy composition separates the different classes -- how? Is it significant who is the center and who is on the periphery? Who borders the action and what are they doing? 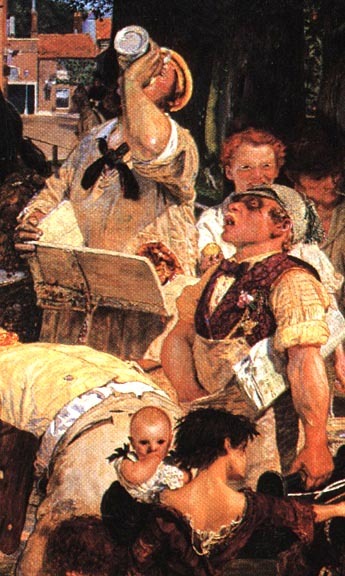 3. althouhgh Brown does praise the lower class laborers in this painting, does he also condemn those above them in class? Hogarth often shows two differing portraits, with one being obviously positive and the other negative. Does Brown portray the middle and upper classes as necessarily idle or in a negative light? Or is he merely glorifying the virtue and importance of hard work? 4. Brown painted Work in Heath Street, Hampstead, near his home, which is reflected in its realism. Had he painted this scene indoors, and not from life, and without the intense attention to detail, would his moral message be as compelling?